I absolutely love this film. I am a fan of In Bruges, so I was delighted to hear that McDonagh took a break from playwriting and wrote/directed yet another masterpiece. Adapting well to the Hollywood setting and America, he presents us with a colourful (and psychotic) cast of characters that are as hilarious as they are deranged. It’s always good to see Christopher Walken in a role that doesn't *completely* parody itself. Yes, his characteristic delivery is still there, but it somehow works, because it’s not any less crazy than the other roles. Woody Harrelson, when not busy promoting ‘Rampart’ is also great here, delivering a comical yet deadly version of a psycho. Not nearly as serious as in Natural Born Killers, but a lot more mature (if you can call it that) when considering his career over the years. Sam Rockwell gets another chance to shine, as he did in Moon and Hitchhiker's and Choke, proving again that he is a severely underused actor. 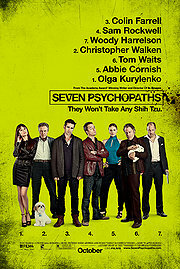 I won’t spoil the plot but suffice it to say that if you enjoyed early Tarantino and Guy Ritchie multiple-narrative ensemble cast crime fare that those two were known for, you are bound to enjoy Seven Psychopaths even more, as it seems to go back to the genre’s roots. It is not yet another example of the genre, and is rather self-conscious (at times reminiscent of a film-within-a-film), but it does this with such ease and fun and joy that is refreshing considering most of everything that’s out there. Finally, as is usually the case, Tom Waits’ dark addition to the cast/plot is very welcome, adding a kind of mysticism and unease that fits right in within the whole feel of the movie. Great work overall, highly recommended.